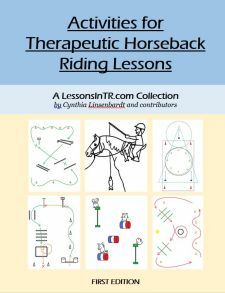 Adaptations and Teaching Techniques for Riders with Severe Disabilities, Part 6: Example Riders, Cont. Mitochondrial Ecephalmyopathy is a condition caused by mutations in the genes in mitochondrial DNA, affecting the brain and nervous system (“encephalo”) and muscles (“myopathy”). It can cause muscle weakness, exercise intolerance, hearing loss, problems with balance and coordination, seizures, learning problems, hearing impairment, migraines, and affect the musculature of the eye and cause vision loss. Objective 1.1: Client will demonstrate halt/walk transitions by holding the reins 100%, min VP, assistance as needed.Progressing to also picking up the reins on his own 100% of the time with min VP, no assistance. Objective 1.2: Client will demonstrate walk/trot transitions by sitting up straight 100%, min VP, assistance as needed. Rider 3 loves the horse’s movement, so I have started using this as motivation to do stretches and activities and learn riding skills. If he does his exercises at the halt, he gets to walk on. Rider 3 has some learning and comprehension delays. When I first started working with him he often got confused or frustrated, not understanding what I wanted (touching horse parts), and not getting what he wanted (the horse to move). So I went back to cause-and-effect relationships and used “First…Then…”. For example, “First touch the mane, then walk on!” Once he got this, I started building on it, adding one more: “First touch the mane AND tail, then walk on.” With consistency, he figured out if he does his stretches he will get to walk on, and now completes 3-4 stretches at a time. I use simple easy warm up stretches he can perform: touch the mane, touch the tail, high fives, touch your helmet, touch the horse’s shoulders, touch the horse’s neck, etc. Rider 3 is low tone and loves to slouch in the saddle. When I first started working with him, I tried to have him sit up straight the whole lesson, but he would only sit up straight after the sidewalkers pushed on his lower back – without it he would slouch again, and eventually he started ignoring the prompts altogether. This resulted in much frustration for everyone, so I switched to only asking him to sit up straight to cue his horse to trot – he loves trotting so this was his motivation. He still needs physical prompts to sit up straight to trot, but enjoys his lessons much more now that we’re not poking his back the whole time. In the future I would like to include sitting straight with cueing his horse to walk on, and eventually his horse only stays walking if he is still sitting up straight. Hold the reins – Rider 3 came to me knowing to ask his horse to walk on by pressing “the button,” or the withers. To transition this more into a riding skill, and to help with the problem of him not wanting to hold the reins, I decided the cue to walk on would be to hold the reins. Initially we held up the reins for him to grab, then the horse walked on immediately. Pick up the reins – Once he understood hold the reins, I progressed to asking him to pick up the reins on his own to ask his horse to walk on. Keep holding the reins – Initially he would drop the reins often. So once he understood that picking up the reins caused his horse to walk, I progressed to teaching him that holding the reins keeps his horse walking. If he dropped the reins, he had 1 try to pick them up again, or the horse stopped until he held them again. He loves to go, so this worked surprisingly well. When the horse would stop, I would first prompt “Oh no he stopped! What should you do?” before telling him what to do if he forgot. Put reins forward – Recently I started teaching him that putting the reins slightly forward asks his horse to walk on. This is the next step in independence, and also incorporates his preference to still “press the button” to ask his horse to walk on (which will hopefully fade out as he learns this new skill). Lean forward for trot on 2/4x PP, 2/4x VP. Rider 4 gets extremely anxious about the mount. His body gets rigid and he bites his hand. His tactile sensitivity prevents us from helping put his hands on the pommel, and his cognition level prevents him from understanding why he need to do so. After much trial and error, I went back to how his past instructor mounting him: put your left arm under his right arm, hook your hand up over the front of his shoulder, then have a sidewalker help lift his left leg over the croup while you use your arm to guide his upper body and let him use his arm on yours for balance. This is the only time I’ve ever used a mount like this, but for him it works, and gets him on the horse with the least anxiety. If anyone has any suggestions I’d love to hear them! Rider 4 is extremely tactile sensitive, will pull his hands away from any touch, and get very agitated if he can’t get away from it. So when we do touch, I use firm pressure that is quick and intentional. When we ask him to touch the mane, if he does not, we used a quick firm hand over hand help on his wrist that takes no longer than 2 seconds. Rider 4 loves his horse’s movement, and the balls. Mounting makes him anxious, so after we mount we walk several laps just to let him calm down (with no one touching him!). If he is still agitated, we play with the ball, and this usually works. Seat aid/lean forward – Rider 4 came to me already knowing to ask his horse to walk on by leaning forward, and at the same time he tended to bounce and push with his seat. His exuberance became very agitating to the horse, so I tried to transition him to “lean forward a little” which he got 50% of the time – not enough to be kind to the horse’s back. Hold the reins – I decided to ask him to hold the reins and try to leave the scooting and bouncing behind. It took a lot of consistency, especially since his tactile sensitivity prevents him from liking the reins, but over the weeks he began to take the reins when we held them up, and even began playing with them like a toy and acknowledging their existence (as opposed to just ignoring them or throwing them up the neck). The more he played with them the longer he held them. Now he will hold them to walk on, and accept them on the pommel with his hands on them while walking. The next step is to have him pick them up on his own. I wish I had learned sooner that speaking in an excited voice really helps. Once his caregiver told me this our lessons got so much better! Act like everything’s a party. Ask him to move over verbally with firm push in side at hip (otherwise gets irritated by light touch and tries to brush you away). (This is what I did when I taught him and it helped). Don’t use any sidewalker holds, just spot. If it’s a good day, trot. If it’s a leaning day, don’t. Shorten the stirrup on the side he leans toward. Use a gait belt to help pull him in the correct direction at the ribcage. Try trotting without stirrups so he can’t brace against them. Give him something to look at, so his head looks up to keep him centered and not twisting or leaning (such as another volunteer waving and calling his name). 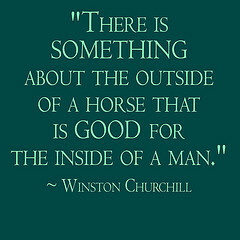 Use a wider based horse.